For quite some time now, I have been a BzzAgent. BzzAgent is a word of mouth media network. As a BzzAgent, I’m invited to participate in campaigns and sometimes offered product samples and promotional freebies. 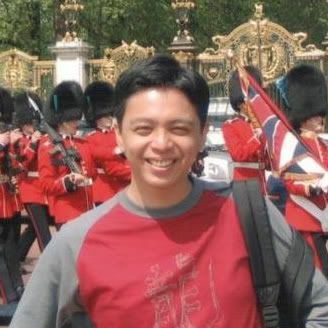 I can choose which campaigns to participate in and then opt to share my experiences with others if I liked the product. For the most part I only participate in food related campaigns as they’re what’s more interesting and relevant to me. Recently I was invited to take part in a promotional campaign for the Egg Farmers of Ontario. I don’t need any excuses to promote eggs, I go through them at an alarming rate. I’ve often said that I need some chickens in my backyard to support my egg habit, (and while we’re on the topic, a cow for my butter and cream habit). Luckily, (?) for me, I live in the boondocks where there are plenty of egg farmers and when I need an extra dozen for a baking spree, they’re not too far away. After signing up for the egg campaign I was sent some brochures on the many health benefits of eggs, (did you know they contain 6g of protein?) some recipe cards, (quiche anyone?) and some seasoning packets, (I’ve always liked adding herbs to my eggs). 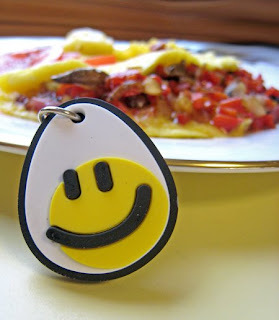 I also received the cute little egg keychain you see gracing the above photo. Like I said though, I don’t need any encouragement to promote eggs, they’re infinitely versatile and probably one of the few things that can take you from breakfast straight through lunch and dinner to dessert. We used to tease my Mom that whenever she was making dinner it was going to be an omelet. Not that she couldn’t make other meals, but after coming home from work, it’s one of the fastest and easiest things to make. 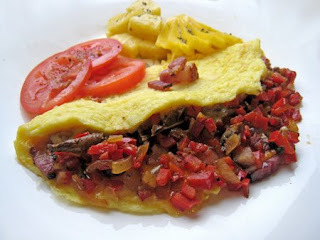 I prefer my omelets for breakfast though and the one you see here has been stuffed with fried onions, peppers, tomatoes, bacon and goat cheese. Another breakfast or brunch favourite of mine is an egg sandwich. Once again, you can really put whatever you want into your egg sandwich and dress it up or down according to what you have in the fridge. 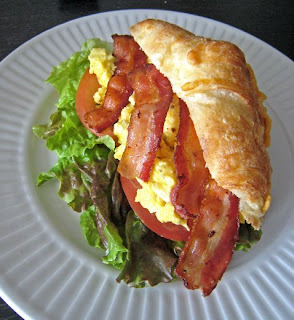 Because everything tastes better with bacon, I chose to make my breakfast sandwich on a cheese croissant with herb scrambled eggs, lettuce, tomato and strips of bacon. It’s the breakfast of champions. What’s your favourite way to eat eggs? Posted by Brilynn at 12:36 p.m.
Over easy, salt, fresh cracked black pepper with multigrain toast. Scrambled, with cheese and fresh herbs, or in egg salad made while the eggs are still slightly warm. I love them in any form, scrabbled, fried, egg salad, omelette, frittata, you name it!! Sunny side up. And since I can't have them since I'm pregnant, I've told my husband that he will be making them for me on our first day home from the hospital after I have the baby!! I LOVE eggs, so I think the question (for me) becomes, "Is there any recipe with eggs you don't enjoy?" To which, of course, the answer would be, "No." Um, I really like egg curry, it's the first one I thought of. But scrambled eggs are nice and soothing. I like the healthiness of a poached egg with toast to soak up the yold. A deviled egg is one of my favorites too. I guess I like them all. I want egg gravy - poached makes beautiful runny gravy! Still I know I'd love your scrambled. I love eggs! They're my comfort food!